Go Fish | 2P START! Well, it’s a Thursday and the world didn’t end or anything, so I guess this schedule will work out after all. I’m not sure how this comic idea popped into my head, but I feel like Lakitu is getting the attention he deserves since our Blueprint For Success comic was inspired by him and he didn’t even make it in the final comic! Hope you enjoy it! Ha, that’s hilarious, though as a bonus a toad skeleton should have been attached. It would have explained why he forgot it. this must be how he came back as a Dry Bones in Mario Kart DS! I actually considered this as part of the joke, but left it as is for a number of reasons. But I guess great minds think alike. Looking at the kart’s design, it must have been from either Super Mario Kart or Mario Kart 64. Wow, It must have been a Loooonnnnnggg time since that one fell in the drink. either that or that kart didn’t qualify for the “Coins for Clunkers” program the Mushroom Kingdom ran awhile back and the owner faked an ‘accident’ so he could get a new one with the insurance. Nice one, it was worth adjusting the schedule for. Finally, I rise from my grave. I have stumbled upon your website via “stumble upon”, and have really enjoyed going through your archives. I occasionally listen to a random podcast when I’m bored, and its really entertaining to listen to. I really like the music you guys put in the podcast, and hope for many more comics and podcasts to come. Oh, and good comic too. You know, I never realized just how weird Lakitus are until just now when I noticed they’re nerdy koopas riding sentient clouds. Yep, you guys hit my sweet spot with that comic. Thank you for that good one. It took me a second to get it, but it was pretty funny once I got the joke (haven’t played Mario Kart n over a year). Success. Nice one! As usual, Ray, I’m looking at the art rather than the concept/joke of the comic. I love that you gave the clouds emotions and a reaction. Pretty good comic. Although the water looks kind of like… gel, rather than actual water. I’m not sure what about it, maybe it’s the gloss but that’s just something weird to me. Also, who says they’re on vacation? They gotta go fishing for those spiky things they throw at Mario. It’s a full time job, he’s just showing little Lakitu the ropes. So umm… I rise from my grave and say keep up the amazing, stupendous, and groundbreaking work! This comic is funny, epic, and rather delightful. Great Comic Guys!! Really cool idea for this comic. And I love that its on Thursday. Just when I thought every Mario Kart joke has already been done, you guys have proven me wrong; clever idea! I saw the punchline coming. It was the first thing I thought of when I saw Lakitus fishing. Not to say it wasn’t clever though. 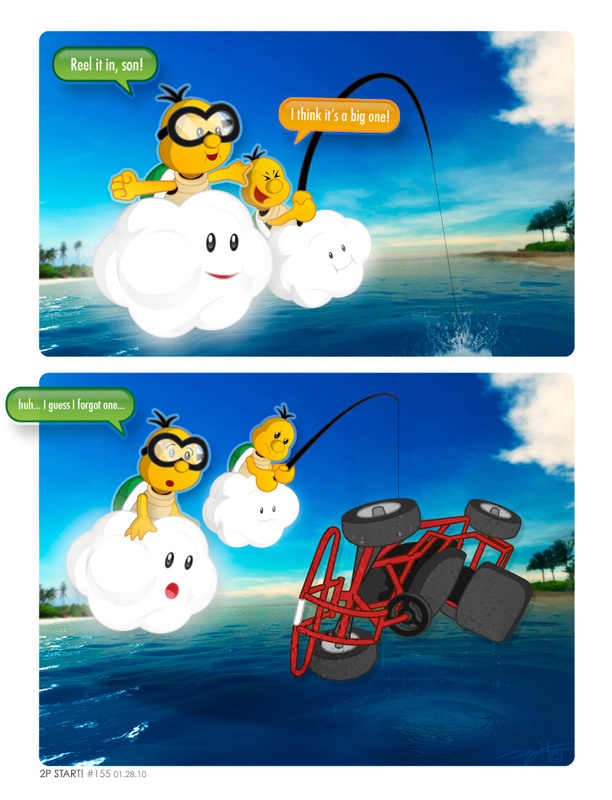 Oh and uh…if Lakitu failed to fish up one of the carts…what happened to the driver? Oh my god you’re bringing up memories of that big/small level in SM64. That fish always made me piss my pants. Oh man, that was great. That’s really all I can say, it was just that awesome. hilarious. i like it. though ive always wondered how u real in a string on a stick. Very nice comic this week guys! The art is beautiful, as can always be expected from Ray. And the comic itself gave me some good chuckles and a big smile that I needed after being stuck in traffic for well over an hour today. I can’t help but wonder what it might look like if Latiku found a “forgotten” kart in Ghost Valley 2. Loving that it’s now on Thursday, I didn’t like all my 2P Startness being bunched up into one week. Short, sweet, and to the point. Great job guys! Well it’s red so… I guess we know why Ray’s comment was short. He had to keep it short as he was drowning. Took a while to sink in, but I laughed. I haven’t played Mario Kart since… Mario Kart 64? Has it been that long? The background for the comic sure is pretty, but hey, what’s that red thing in the backround? To the left of the first cloud! Is it a shack? Is it a secret? What could it be?!! Great comic guys. My favorite part is something I didn’t even notice until a third look and that is Lakitu’s cloud’s face. His son’s cloud’s face had a look also, but Lakitu’s cloud’s :O look just made me laugh and the comic just wouldn’t be the same without it. The most hilarious part is that all of the characters besides that cloud are either confused or slightly surprised except Lakitu’s cloud which is more surprised than Lakitu himself. Well, I guess he should be, as it’s HIS job carry Lakitu every where. Again, great comic guys. Ya did it again guys. I predict winning the Weekly Webcomic Wrapup on Joystiq. Good job! I was anticipating Starfy to be reeled in, which sounds more like something BitF would do. Nice one. The clouds actually change facial expressions too! It has finally come time… I am grave rising folks. I have been following your comic since #131, and have loved it ever since. I have listened to all your podcasts many a times, and now that I have my own show I realized how important all comments are to me so I thought I should finally leave my favorite site one of my own. So I am sorry, but now as I dust of the dirt and rise from my grave, I am reborn again into the beautiful world of 2pstart…. Oh and NCG by the way. Had me lol-ing for quite some time. There’s something about this comic that’s…off. Not your style of humor. I would’ve laughed if it was a different website, but when I opened up the page at 6:00 in the morning, I felt let down for some reason. What is this more like… Dueling Analogs? I like it, but why is it written like a very bad poem? Like other’s have said, I wonder what happened to the driver. And someone else brought something up that I would like confirmed or denied. TheLupineOne identified the background as Shy Guy Beach from Super Circuit (also remade into Wii). Is it supposed to be that, Ray? To me it seems to make sense, as Super Circuit used the conventional, SNES/N64 style karts. It likely is Shy Guy Beach. If you look through Ray’s recent Twitter history, you’ll note that he links the Shy Guy Beach theme as a “hint” prior to the release of this comic. For some reason, I thought that was the buggy from Half-Life 2 at first. I actually had to read the description in order to realize what it was and get the joke. But once I did get it, it greatly amused me, so NCG. That’s what it looked like to me as well, except for the lack of the roof portion and the fact that the HL2 one is orange-ish. Postmordem: Failure to protect essential assets. I also had a spit-take and thought it was the Half-Life buggy. Heh, I was just playing Half Life 2 right before reading this. I also just played that car part as well. Mario Kart jokes are good too. All it needs is the rollcage, a slightly more orange color, and the Tau Cannon, and we’re good to go! Hey, I’ve recently discovered your comic, thanks to BitF, and I have to say, it’s hilarious! (I read all of the strips in a couple of days.) I have to ask you something Ray: Seeing as how you’re a big Sonic fan, I’m surprised you never did a joke about Sonic the Hedgehog’s RPG outing by Bioware. What did you think about that one? I, being a Sonic and RPG fan myself, thought it was great. It was discussed in one of the podcasts, unfortunately, I’m not sure which one. Sonic Chronicles? …I see. Unfortunately, I don’t know which one either. I was actually hoping Ray would personally answer, but whatever. It’s easy to know. Go look for it in the Black Doom Award Archieve. It won one for its dreaded music. But what about the rest of the game? I agree with the music, though. Most of the “classic remixes” are more obscure (Central City and Blue Ridge have remixes of the Genesis and Saturn versions of Diamond Dust Zone of Sonic 3D Blast, respectively.) They don’t even have a remix of “Green Hill Zone” IN GREEN HILL ZONE! It might sound strange, but this happened to me once. In a race I fell in the water, and lakitu picked out a kart with no driver. Nice comic! It was probably Dong Kong Jr. That would explain why he hasn’t been in a Mario Kart game since the first one. I hope it was R.O.B. i hate him hes my second least favorite brawl character. Use the same e-mail address you use for here. You may have to use the same login info as well (I did) but I’m not one hundred percent sure. Now I know where the Koopa Troopa from Super Mario Kart went. As for the track, it’s probably Koopa Beach 1 or 2. And THAT’S why the karts can go under water in Mario Kart 7!